Cromford is a village and civil parish in Derbyshire, England, in the valley of the River Derwent between Wirksworth and Matlock. It is first mentioned in the 11th-century Domesday Book as a berewick (supporting farm) of Wirksworth and this remained the case throughout the Middle Ages. The population at the 2011 Census was 1,433. It is principally known for its historical connection with Richard Arkwright, and the nearby Cromford Mill which he built outside the village in 1771. Cromford is in the Derwent Valley Mills World Heritage site. The River Derwent, with its sources on Bleaklow in the Dark Peak, flows southward to Derby and then to the River Trent. The geology of this section in the Derbyshire Dales is that of limestone. The fast flowing river has cut a deep valley. The A6 trunk road, which was the main road between London and Manchester in former times; the Cromford Canal and the Derwent Valley Line, linking Derby and Matlock, were all built in the river valley. The Via Gellia valley joins the Derwent at Cromford, however, the stream which runs through that valley is actually the Ivonbrook and historically the valley was called the Ivonbrook Valley. The Via Gellia is simply the name of the road which runs along it, named after the Gell family who owned many mines in the area. The A6 passes to the north of the village of Cromford; its land rises from 80m to 150m above mean sea level. 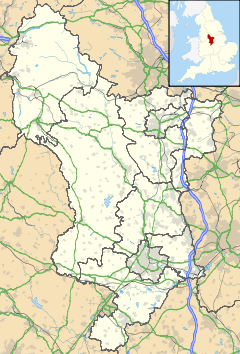 It is 27 kilometres (17 mi) north of Derby, 3 kilometres (1.9 mi) south of Matlock and 1 kilometre (0.62 mi) south of Matlock Bath. Trains operate from Cromford Station, on the north bank of the Derwent to Derby and Nottingham. It is one of the significant sites in the development of the Industrial Revolution. Here, Richard Arkwright built his cotton mill to make use of the water frame. The Gell family, who were local Hopton landowners heavily involved in the nearby Wirksworth lead mining district, had the Via Gellia built to connect Cromford and Grangemill in the late 18th century. Some cottages and farm buildings pre-date Arkwright's time, but a large part of the village was built to house the mill workers. They were provided with shops, pubs, chapels and a school. The 20th century saw the development of council and private housing. Dene quarry, currently operated by Tarmac Ltd for the production of aggregates and roadstone, was excavated to the south west of the village from 1942 onwards. In December 2001 a 15 miles (24 km) corridor from Masson Mill in Matlock Bath to the Silk Mill in Derby and including the mills in Cromford, Milford, Belper and Darley Abbey was declared the Derwent Valley Mills World Heritage Site. The 1931 novel Saturday Night at the Greyhound by John Hampson takes place over the course of one evening in the bar at the Greyhound Hotel, Cromford. In late 2006, Anand Tucker used certain parts of Cromford, including its historic bookshop, for his film And When Did You Last See Your Father?, based on the autobiographical memoir by poet Blake Morrison. Colin Firth plays the adult Blake, with Jim Broadbent cast as his dying father. An industrial site in the German town of Ratingen is named Textilfabrik Cromford after Cromford, as this is where the industrial pioneer Johann Gottfried Brügelmann in 1783 erected the first factory outside England, using Arkwright's factory as an archetype. The factory today forms part of the Rheinisches Industriemuseum. Cromford railway station is located on the Matlock–Derby Derwent Valley Line and can be seen on the cover of the 1995 Oasis single "Some Might Say". Historically Cromford was part of the Wirksworth Wapentake or Hundred, this administrative area, also known as the Soke of Wirksworth (the "small county of Wirksworth") became, in due course, West Derbyshire Council and is now called Derbyshire Dales District Council. The village is run locally by the Cromford Parish Council. The Cromford Mill (1771) buildings and accommodation for workers to staff the factories form part of the Derwent Valley Mills, which is recognised as a World Heritage Site for its importance. North Street, constructed by Arkwright, is important as a very early purpose-built industrial workers' housing, and was rescued from dereliction in the 1970s by the Ancient Monument Society who have since sold off the houses. One house in the street is now a Landmark Trust holiday cottage. Masson Mill (1783) is on the northern fringe of the village. Willersley Castle dominates the hill on the east side of the river, with commanding views of Masson Mill, the village, and the road from Derby. Commissioned by Richard Arkwright, building work began in 1790, but was delayed by a fire in 1791. Richard Arkwright died in 1792, and the building was occupied by his son Richard in 1796. The Arkwright family moved out in 1922, and the building was acquired by some Methodist businessmen, and opened to guests as a Methodist Guild hotel in 1928. During World War II, the building was used as a maternity hospital by the Salvation Army while evacuated from their hospital in the East End of London. St Mary's Church, Cromford built between 1792 and 1797 by Richard Arkwright. The Cromford Canal – built to service the mills – is now in disuse, but has been designated a Site of Special Scientific Interest (SSSI). The canal tow-path can be followed from Cromford Wharf to High Peak Junction, and on to Whatstandwell and Ambergate. The Cromford and High Peak Railway, completed in 1831, ran from High Peak Junction to the Peak Forest Canal at Whaley Bridge. Its trackbed now forms the High Peak Trail, a walk and cycle route which is joined by the Tissington Trail at Parsley Hay. George Turner (1841–1910), landscape artist, was born here. Alison Uttley, (1884–1976) writer, was born nearby at Castle Top Farm. The Greyhound Hotel built for Richard Arkwright in 1778 for the use of businessmen and others visiting the mills. Cromford Pond built in 1785 as the pound for Cromford Mill. This shuttle, locally known as "The Bear Pit" controlled the water from the sough into Cromford Pond. A mid-nineteenth century water wheel for a mill grinding locally mined barytes . It is no longer used for any purpose but can be seen turning on occasion. ^ "Civil Parish population 2011". Neighbourhood Statistics. Office for National Statistics. Retrieved 22 March 2016. Wikimedia Commons has media related to Cromford. Wikivoyage has a travel guide for Cromford. This page was last edited on 5 February 2019, at 14:30 (UTC).